The snippet shown below on the right was in the February 1917 “Pottery, Glass and Brass Salesman” journal. 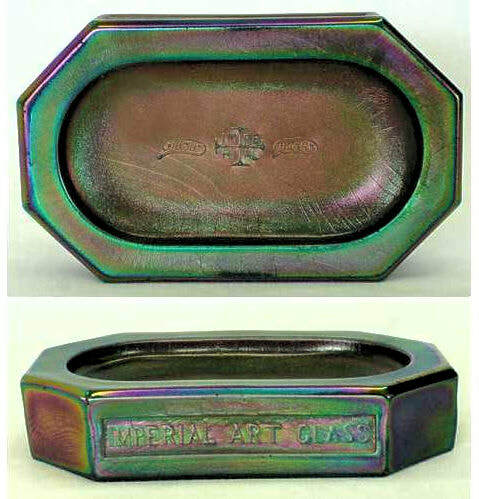 It caught our eye, referring as it did, to a “paperweight, done in art finish iridescent, advertising the "Nu-Cut" art line of the (Imperial Glass) company”. Of course, there is only one piece of glass this could possibly be referring to – the scarce and lovely “Imperial paperweight” that has the moulded lettering NUCUT and NUART as well as the Iron Cross Imperial mark, and the factory name (see above, right). They are about 5½ inches long and are known in two colours - purple and marigold - with a delicious stretch iridescence, typical of pieces in Imperial’s NUART range. The purple examples have been known for many years, but it was only in November 2017 that the ​marigold example pictured below came to the attention of collectors when it was reported on Facebook by Don Leininger. A marigold Imperial Paperweght. Photo courtesy of Don Leininger. the 1916 “Pottery, Glass and Brass Salesman”. ​The Imperial Paperweight - when was it made? ​​We know that Imperial first introduced their "Nucut" range in their January 1912 catalogue. Undoubtedly, "Nuart" followed shortly after - the January, 1913 “Crockery & Glass Journal” reported that NUCUT and NUART were being used and were very successful, adding “Nuart was a success from its inception”. Later, an ad on the cover of the December, 1913 “Crockery & Glass Journal” proclaimed, under an illustration of the NUCUT and NUART logos, that “you are well acquainted with ‘Nucut’ and ‘Nuart’ ”, confirming that those two trademarks were already well established. The other distinctive trademark - seen in the very centre of the paperweight - is known as the Imperial Iron Cross trademark, and the use of this characteristic logo should help us date the paperweight. But it’s not that simple! We feel that these dates are much too late, for the production of the paperweight. Firstly, we have the evidence of the “Pottery, Glass and Brass Salesman” in 1917 describing what is surely this paperweight, and now we also have evidence to show that the IMPERIAL Iron Cross trademark was in active use from at least as early as August 1914 (see below). The Imperial Iron Cross trademark - the design was patented in 1914. The evidence strongly suggests that the Imperial Paperweight was in Earl Newton’s showrooms (and no doubt also in Imperial’s New York and St Louis showrooms too) in 1917.
Who Was Earl William Newton? The 1917 “Pottery Glass and Brass Salesman” extract refers to Earl W. Newton, describing him as a “factory representative”. In fact, Newton was so much more, and indeed just over a decade later he would go on to become the President of the Imperial Glass Company. In 1912, at the age of thirty-one, Earl Newton had become the Chicago agent for Imperial … and he had ambitions. He was a hard worker, representing Imperial at trade shows and conventions in the thriving Midwest, as well as running a popular and growing showroom. ​In December 1915, according to the “Pottery, Glass & Brass Salesman”, Newton moved from “the seventh floor of the Kesner Building, where he has been for five years, to the seventh floor of the Heyworth Building (shown below). He has taken larger and better quarters, now having at his disposal almost twice the amount of space he had in the Kesner Building”. More space in a prestigious location meant greater presence and increased sales potential for Earl Newton. The new Imperial lines, Nucut and Nuart had recently been introduced, and Newton now had the perfect premises for displaying and promoting the very best of Imperial’s glass. And in 1917, he was able to showcase the recently released, stunning Imperial paperweights. The Heyworth Building in Chicago. Picture courtesy Archimaps. An ad in the February 1916 "Pottery, Glass & Brass Salesman" showing Earl Newton in his new offices. Note also the inclusion of Cox & Lafferty in this ad. We have a major feature about Cox & Lafferty's sales catalogues for Imperial Carnival Glass - see them all here: Sell me some Imperial Glass! ​Note that at the bottom of the 1916 ad it states Imperial had a "Weekly Capacity over 5,000 Barrels". A wholesale ​ad from around the same time shows Imperial Carnival assortments (bowls, comports, vases and similar) being sold at "12 dozen to barrel" - that is 144 in each barrel. Multiply this up by 5,000, and you arrive at - Imperial's output capacity was at least 720,000 pieces of glass per week! That is an astounding figure, if we believe the 5,000 weekly capacity. Yes, it could be advertising hype, but in our article on the devastating Ohio River floods of 1913 when the Imperial factory was totally flooded, 28,000 barrels of glassware were submerged and had to be sold off cheaply - that would amount to a storage inventory of around 5 week's production, which seems realistic. ​Was it intended as a Paperweight? You’d think the answer would be straightforward, wouldn’t you, but as is often the case with Carnival Glass, there’s a bigger story. In the Imperial Encyclopedia Vol I **, it is described as an “iridescent change tray” while others refer to it as a pin tray or paperweight. It has also been suggested that it was made as a souvenir for visitors to the Imperial factory - however, it seems more likely to us that these beautiful and showy items were destined for the Imperial commercial showrooms in the big cities, where they would get maximum exposure. Imperial had three huge showrooms in prestigious central locations – in New York, Chicago and St. Louis – that were advertised and promoted in the trade journals and house furnishing magazines. These showrooms were where buyers went to look for glass – this was where promotional items would have been on show. ​general office paraphernalia. The idea of coins being clattered onto that beautiful iridescent surface and scratching it, is rather disturbing, but again, there’s another story behind this. A side-on view the marigold Imperial Paperweght. Photo courtesy of Don Leininger. Surely the answer is that the item was a multi-purpose piece. It’s clearly intended as a paperweight – its weight, its shape and size are absolutely fit for purpose. Add that space on top for bits and pieces, coins, cards, what-you-will, and you’ve got the perfect office accessory. Beautiful AND useful - the typical office desk of the period (see above right) would surely benefit from such a desk tidy! It seems likely that the Imperial workers – at a time when the emerging workers’ Unions were trying to establish better rates of piece-work pay for the glass workers – wanted the item classed as a change tray which possibly got them better pay rates (because it was a multi-use piece).​ Above all, it was an advertising piece, intended to promote Imperial’s glass. The lettering on both long sides reads IMPERIAL ART GLASS IMPERIAL GLASS COMPANY BELLAIRE OHIO U.S.A. and on the top, the three Imperial trademarks, promoting the company and the two new lines (NUCUT and NUART). So, we have a multi-purpose, advertising paperweight, for the Imperial Glass Company and its wares, marketed as a promotional item from around February 1917, made in purple and marigold. Quite a back-story for just one small piece of glass. * The Encyclopedia of Carnival Glass Lettered Pieces by John Resnik. ** Imperial Glass Encyclopedia Volume I edited by James Measell.